CLAREMONT and West Perth won pre-season hit outs on Saturday night to remain unbeaten heading into the 2013 campaign proper with East Fremantle and South Fremantle also recording victories during the day. 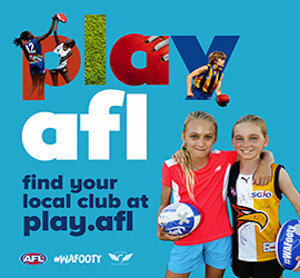 West Perth beat Peel Thunder 14.10 (94) to 13.7 (85) at Bendigo Bank Stadium, East Fremantle downed Perth 17.8 (110) to 11.7 (73) at Brownes Stadium, Claremont won against Subiaco 15.5 (95) to 14.4 (88) at Medibank Stadium and South Fremantle beat Swan Districts 18.8 (116) to 11.9 (75) at Fremantle Oval. Two-time reigning premier Claremont made it three straight pre-season wins coming off victories over Swan Districts and East Perth, and won a hard fought battle at Leederville's Medibank Stadium by seven points on Saturday night. Despite missing Andrew Foster, Blake Anderson, David Crawford, Chad Jones, Ryan Neates and Byron Schammer, Claremont remained unbeaten with a seven-point win over Subiaco. Jack Bradshaw kicked three goals as did Ian Richardson and Jeremy McGovern. Mitch Andrews and Paul Medhurst kicked two each. Jake Murphy gathered 21 possessions with captain Andrew Browne also gathering 21 disposals to go with eight marks and three inside 50s. Luke Blackwell gathered 19 touches, Hugo Breakey 19, Nick Winmar 18, Andrews 17 and James Thomson 16. 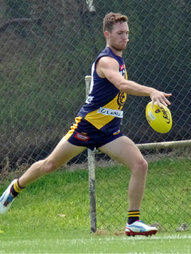 Callum Sinclair was once again a dominant presence for Subiaco with 24 possessions, eight marks, 20 hit outs andthree goals. Alliston 'Buddy' Pickett also kicked three goals with Chris Deluca and Clancy Wheeler booting two. Jason Bristow gathered 19 possessions, Brett Mahoney 18, Wheeler 17, Ben Randall 16 and Aidan Parker 16. West Perth backed up its win over South Fremantle the previous week holding on to beat Peel Thunder by nine points at Mandurah's Bendigo Bank Stadium also on Saturday night. 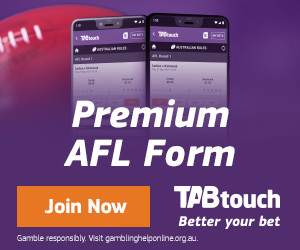 The Falcons kicked six goals to two in the third quarter to set up the win over the Thunder with Fremantle's Josh Mellington booting four goals, Matthew Johnson three and Anthony Tsalikis two. Shane Nelson continued his outstanding form in the midfield from last season racking up 30 possessions with Steven Browne picking up 28 disposals, Marc Crisp 25, Aaron Black 23, Jordan Jones 22 (and 15 marks), Ray Bartholomew 21 and Rohan Kerr 20. Veteran defenders Dan Hunt and Michael Pettigrew were also impressive while Frank Stockley had 11 disposals, 10 hit outs and a goal in the ruck. Kristin Thornton kicked three goals for Peel and Jarrhan Jacky two with captain Brendon Jones racking up 30 possessions, Pat Travers 31, Paul Bower 26, Matt Orzel 21, Drew Robinson 21 and James Hawksley 19. Peel also had good service from Fremantle's Jesse Crichton (31 possessions), Peter Faulks (14), Craig Moller (10, 11 hit outs), Jack Hannath (10, 37 hit outs), Viv Michie (27), Jayden Pitt (23), Tanner Smith (10) and Alex Forster (13). South Fremantle won its first pre-season game following losses to Perth and West Perth beating Swan Districts by 41 points at Fremantle Oval on Saturday on the back of 11 goals to four after half-time. Ashton Hams sent an emphatic reminder to West Coast coach John Worsfold that he could still have plenty to offer the Eagles forward-line in 2013 kicking five goals from 13 possessions. Ben Saunders added three for the Bulldogs. Former Port Adelaide midfielder Mitch Banner continued his strong pre-season form for South Fremantle as well with another 26 possessions and two goals in a best on ground performance. Veterans Kris Miller and Craig White also impressed for South Fremantle as did former Claremont big man Alistair Gillespie who had 15 disposals, five marks and two goals. Tim Geappen kicked three goals for Swan Districts with recruit from Perth Matthew Rogers kicking two from 16 disposals. Shaun Hildebrandt racked up 19 possessions, Matt Riggio 18 and Tom Roach 18 with the veteran trio showing they will be a force once again in 2013. East Fremantle made it two wins and a draw from its three pre-season games recording a comfortable 37-point win over Perth at Lathlain's Brownes Stadium. 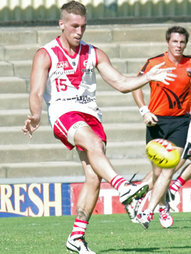 Versatile and experienced big man Rob Young kicked four goals for the Sharks to go with 11 possessions and 22 hit outs. Brett Peake, Ryan Lester-Smith, Aiden Tropiano, Fraser MacDougall and Sam Menegola all kicked two goals apiece. Bradd Dalziell picked up 26 possessions for East Fremantle, Menegola 25, Cameron Sutcliffe 24, Rory O'Brien 24, Sean Henson 22, Mark McGough 20, Garrick Ibbotson 20 and Lester-Smith 18. Simon Tunbridge, Brennan Stack and Simon Donovan booted two goals each for Perth with Michael Mather picking up 23 possessions, Matt Moody 22, Alistair Smith 22, Paul Bevan 21, Brett Hodge 19, Dene White 19 and Daniel O'Sullivan 18.